There are three ways to catch fish to sell through your shipping bin. 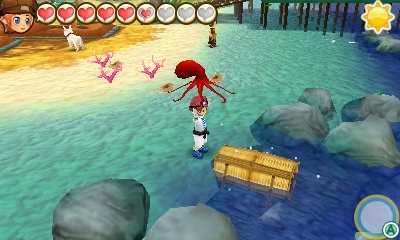 You can go trapping for fish in Lulukoko Village, use a fishing pole to catch fish in any of the area waters, or you can raise your own fish and pearls by using Fish Hatchery boxes. The pole fishing and fish trapping will help you create inventory that you can use to grow on your own farm using the hatchery system. The only place you can catch fish by using a rattan basket is in Lulukoko. Once you raise Lulukoko's Town Link Rank to Rank D, the Polepole shop on the beach will sell Fish Traps for 300 G each. Buy a basket and then walk over to the rock-protected area on the shore. Press the A Button on your Nintendo 3DS to place a Fish Trap into the water. The next step is to wait for items to get caught in the trap. You can then walk away and check back on it later. After about 5 hours the basket in the water will start to shake. Stand next to the trap and press the A Button again to collect the fish and objects caught in the basket. You could also let the basket continue to collect for up to 10 hours. The longer you leave the basket in the water, the rarer the fish and items that can be caught. The Fish Trap will stay in the water even if it goes beyond 10 hours. It just won't continue to keep collecting more stuff after that time. The fish trapping trophy level, found in your farm house bookshelf, determines the Star Rank of the items that you collect from the trap. As you harvest more fish from the basket, the trophy level and Star Rank will increase. You'll need to harvest 3000 items from the Fish Trap to reach the highest fish trapping trophy level. The Fish Trap will break after you harvest from it three times. Once it breaks, simply place a new Fish Trap in the water and wait again. On Spring 8 of your first year or later, walk from the Crossroads to South Westown to meet up with Uncle Frank. He tells you how you can go fishing in the stream to catch fish to sell or cook. Frank doesn't give you a fishing rod though; you have to go to Gulliver's in North Westown to buy a rod for 300 G.
There are thirteen fishing spots in the game located in seven areas. Some areas have the same fish no matter where you drop your line, but some areas have multiple fishing spots where you'll catch different kinds of fish. While the same fish appear year round when fish trapping, the fish caught when pole fishing will change from season to season. The fish you catch on Connection Island don't count towards the fishing achievements or your discovered fish list. There aren't any island-specific fish located here that can't be caught in the main game; basically, you do not have to go to Connection Island to catch all of the possible fish in the game. Fishing is pretty easy to do. 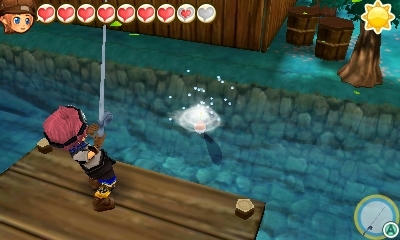 Just equip the fishing rod, stand anywhere next to water (it does NOT need to be at a fishing dock), and then press the A Button on your Nintendo 3DS to toss your hook into the water. When you see the fish grab the bobber (there is no audible sound you can react to), press the A Button once again until you reel in the fish. No need to press the A button over and over! You can use fish bait to entice the fishies to bite at your hook. Bait can be purchased at Polepole in South Lulukoko. You can also craft it by bringing the right types of fish and 10 G to Jambalaya in North Lulukoko, 99 G and Up in North Tsuyukusa, and Gulliver's in North Westown. There is also a fishing bonus status effect that will increase the bite rate. The higher the fishing trophy level you have, the greater the Star Rank of the fish you will catch. You'll need to catch 3000 fish to reach the highest fishing trophy level. The effectiveness of the fishing rod determines the kinds of fish you can catch. Some fish require you to have a minimum effectiveness before they appear. Upgrade your effectiveness at Ludus' shop. have the effectiveness of your fishing pole at level 5. Some whoppers even require you to catch another whopper before they'll appear! Whopper fish are not tossed back into the water when you catch them. You can keep these fish and even use the Fish Hatchery to produce more whoppers to ship for profit.